…it is troubling that, this holiday season, the gay activist organization GLAAD is expressing its "Only Wish" as creating a new normal where children will be deprived of the love of either a father or a mother on a regular basis, and indeed that this situation will be rewarded and incentivized by the government. Of course GLAAD's "Only Wish" campaign, as even NOM notes in their blog post, is for all 50 states to have marriage equality. The rest is the standard drivel that was cooked up by NOM and the US Conference of Catholic Bishops years ago. NOM's problem and the USCCB's problem is that the Church disapproves of gay parents. Their opposition has nothing to do with social science. Rather it is their interpretation of ancient (mostly bronze age) texts that have no connection to the world in which we live. Perhaps it is time for them to change. They have stopped burning witches and Protestants. They have even ceased stoning brides who turn out not to be virgins. Similarly, they can stop their bigotry towards gay people. It seems long overdue. Not once has National Organization for Marriage considered that gay couples are raising children and have been for decades. Never have they considered that those kids have more economic security and societal stability if their parents are married. NOM and the USCCB (which are pretty much the same thing) would like to pretend that gays are not raising youngsters. Yet, whether through adoption or prior marriage, gay are raising millions of children in this country. NOM and its Opus Dei affiliates spent hundreds of thousands of dollars to fund a study to prove that gay couple were terrible parents. Somehow, they calculated that this would then be connected to the disparagement of marriage equality. When their researcher, Mark Regnerus, could not deliver the goods (his study didn't include gay couples), NOM and Witherspoon Institute claimed that the "research" proved what they paid for anyway. These self-righteous types have very little problem not telling the truth in order to get their way. The fact that gay couples have children is the reason for making marriage equality a reality in all 50 states. 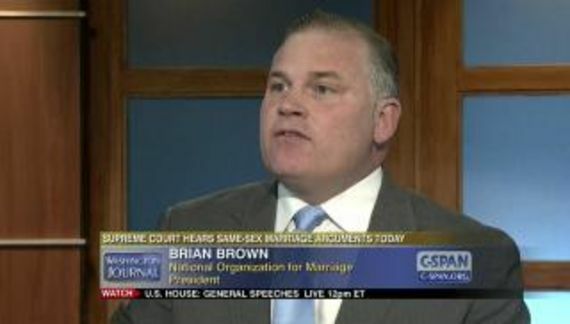 Denying gay couples the right to legally marry denies equal protection to those kids. Every study that actually has researched the wellbeing of children raised by gay parents has determined that they are as healthy, happy, well adjusted and socially successful as their peers raised in "traditional families." Over the last few years, the Catholic Church has spent countless millions of dollars to prevent gay people from marrying. Much of that was disposed of during one of the worst economic periods in our nation's history. Don't any of these people have the presence of mind to know what is really important?